Bummer. Thats one of your nicest looking builds. Love that color scheme. I crashed so many times today it wasnt funny. Blew 2 months budget worth of props in like 2 hours. At least I didnt let the magic smoke out of anything. 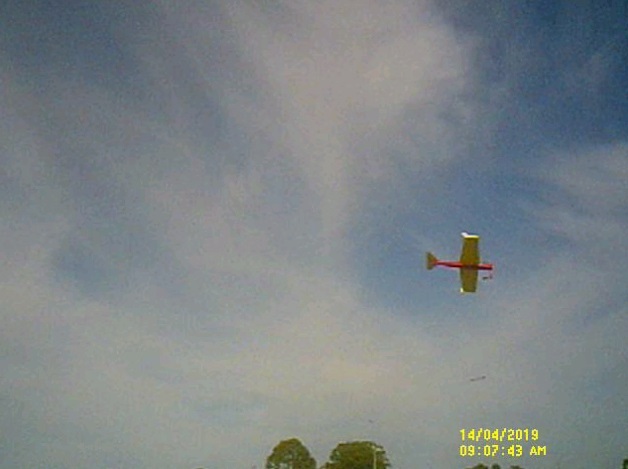 Managed to get a clip out of the video showing a flyby with the motor and prop hanging off of the front of the plane, (Quick Trick). Yesterday's crash. 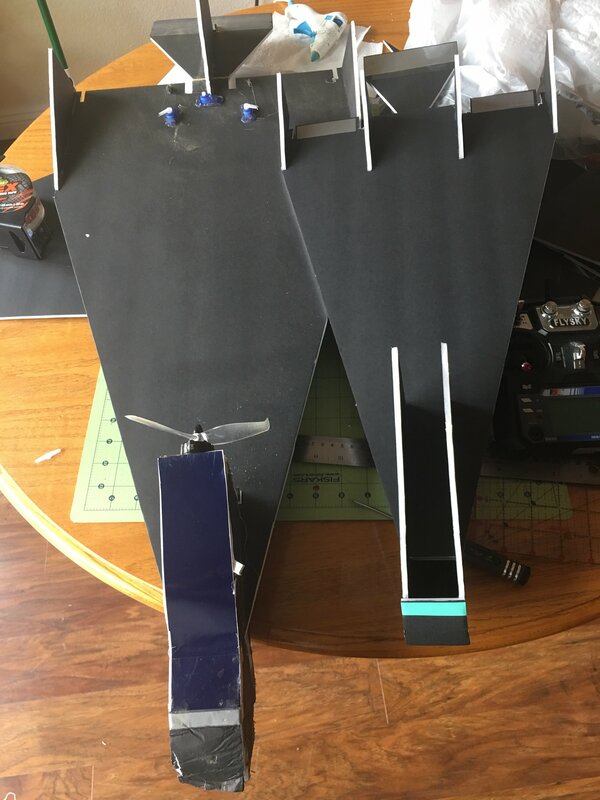 Ironically, my first RC plane, and one of the easiest to fly. I let her get a bit too low before trying to climb out again, and instead of climbing, she nosed over and went prop-first into the hard-packed Arizona dirt. Should be repairable with some BBQ skewers and Gorilla Glue. Definitely - I have a HawkSky with the same features. Now it has 2 fuselage length carbon fiber implants. Has stayed together for years. You'll never be afraid of crashing it again. If using Gorilla glue you may not need skewers! You could get away with a few toothpicks which are a lot lighter and will hold in the foam when glued equally well! My newest birdy. I had the most success yet and got some sweet climbs and a couple turns, then I just couldn't keep the altitude up and she plummeted, now the nose is ten flavors of messed up. Both crashes, the elevator rod was missing. I have a sneaking suspicion pilot error might not have got me so much as a servo arm popping off. I can try to rebuild her nose, or start over with the electronics. For now, there's a baby version for an 1806 2s setup ready to be linked and loaded. How are you connecting your control rods? Any close up pictures? Basic double z bend. 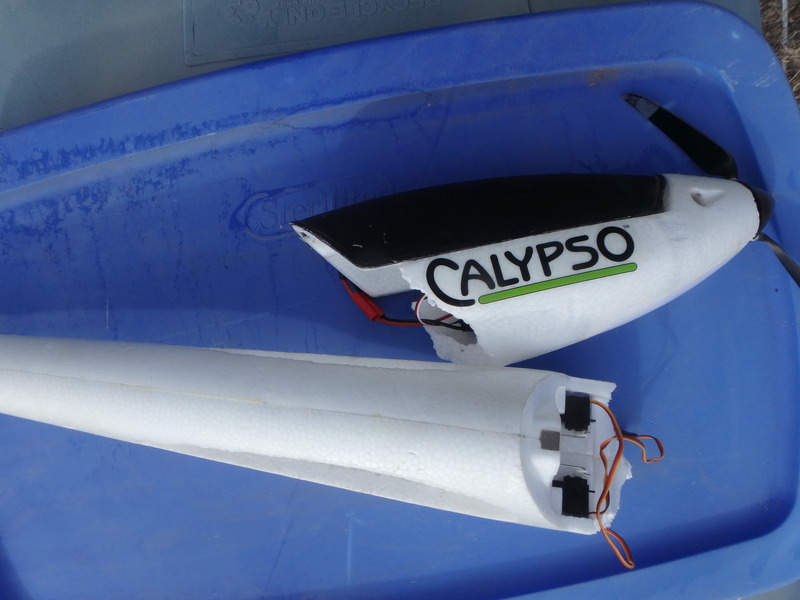 Both times after crash the push rod and the servo arm were missing together. I should probably glue the servo arms down with a spot of glue, since I'm assuming this is where the failure was. The first time I thought it was pilot error and that the arm and rod popped off during the crash. After the second, with a distinct feeling of not being able to pull up before the crash, it became clear what was probably happening. Basic double z bend. Both times after crash the push rod and the servo arm were missing together. I should probably glue the servo arms down with a spot of glue, since I'm assuming this is where the failure was. Are you screwing the arm in? It shouldn’t come off if you screw it on. Not a metal arm the plastic part. Not using metal arms. The white plastic bit that pops onto the servo and where my rods connect with a simple z bend through the hole. That probably should have been glued on. The hole in the middle of the arm (where it pops onto the servo) is for a screw, use the smaller screws that should have come with the servo to screw it on. I’ll drop in a picture later. DOH. Should have realized that's what all the tiny screws were for. Makes sense now. What a dumb mistake, to wreck the nose of my nice plane in an otherwise promising flight. At least my design isn't d00dy this time and my pilot skills aren't that bad any more. Banking so nice with the wingtips. I'm going to try to repair that messed up nose. maybe panel and reinforce it with fresh poster board coverings over the wrinkly areas after I glue and straighten as best I can. I should have those little screws stored somewhere. If not, a careful dab of hot glue will do. Hopefully I can get her airworthy again, if not completely as pretty looking. If not, I will strip the electronics and rebuild. Before that rebuild though, I have the little baby airframe for a little 2s mini/micro version. Overlooking stuff like this can have annoying consequences, but on the up side, a minor building error is easier to fix than design flaws and bad piloting. Not pilot error - construction error! Just say someone else built the plane, and blame it on them!